Chengdu:Chinese vice-Premier Wang Qishan warned on Monday the global economy is in a grim state and that an “unbalanced recovery" might be the best option, at talks where senior US officials said the mood at home towards China was souring. The remark marked Wang’s second dire comment on the world economy in just a few days. On Saturday, he said a “chronic" global recession was “certain" and China must focus on its domestic problems. Policymakers globally have expressed increasing alarm at the risks facing the world economy, mainly stemming from financial contagion in Europe. On Monday, Singapore and Thailand forecast their economies would shrink in the fourth quarter and Japan posted a much bigger fall in October exports than expected. Wang, speaking at the annual US-China Joint Commission on Commerce and Trade, or JCCT, in the southwest Chinese city of Chengdu, also said China and the United States should work together to achieve balanced economic growth. But his comments also suggested that Beijing should attend to bolstering China’s own growth before it worried about global imbalances -- in other words, that a strong Chinese economy that brings a continued trade deficit with the United States would be better for the world economy than a slowdown in China itself. “An unbalanced recovery would be better than a balanced recession," he said. “As major world economies, China and the United States would make a positive contribution to the world through their own steady development," Wang told dozens of trade, investment, energy and agricultural officials from each government seated in a conference hall. Wang’s Saturday comments on the global economy were the most downbeat to date from a senior Chinese policymaker and weighed down Chinese and Hong Kong stocks on Monday. World markets were also weak, over worries about the euro zone debt crisis, which represents the biggest threat to the world economy. “The one thing that we can be certain of, among all the uncertainties, is that the global economic recession caused by the international financial crisis will be chronic," Wang was quoted as saying by the official Xinhua news agency. China’s growth is slowing - down to 9.1% in the third quarter from 9.5% in the second-quarter and 9.7% in the first quarter, but the rate remains within the government’s comfort zone. After tightening monetary policy to fight the threat of inflation, the central bank has since loosened its grip on bank credit in a bid to support cash-starved small firms and pledged to fine-tune policy if needed as economic growth slowed down. “It’s clear now that Beijing is ready to make policy fine-tuning (to support growth) at a time when the overall domestic and foreign economic situation is not optimistic," said Hua Zhongwei, an economist with Huachuang Securities in Beijing. The JCCT talks do not address exchange rate policies, but US officials at the talks warned Wang and his colleagues that they could not ignore rising American impatience with China’s trade policies and investment barriers. US souring with China’s trade-boosting policies spilled into President Barack Obama’s meeting with Chinese Premier Wen Jiabao on Saturday in Bali, when Obama raised China’s exchange rate policies, which many in Washington say keep the yuan cheap against the dollar in order to help Chinese exports. “I think yuan appreciation would bring more benefit than harm to China," said Zhong Wei, an influential economist at Beijing Normal University in Beijing. “It will force China to improve its economic structure. But the benefits for the United States are nearly zero. “Cheap Chinese goods have been a subsidy for the poor in the US, and now the US government want to eliminate such subsidy while it’s having difficulty creating jobs." At the heart of the trade friction between the two countries is the US trade deficit with China. It swelled in 2010 to a record $273.1 billion from about $226.9 billion in 2009, in spite of both government’s pledges to strive to correct “global imbalances". The deficit has since come down -- Beijing said earlier in November it expects the surplus to be $150 billion this year -- giving China some ammunition for its argument that it has indeed made progress in addressing US concerns. The US secretary of commerce John Bryson told the talks that his government welcomed more expanded trade and investment, on balanced terms. “But a reality also is that many in the US, including the business community and the Congress are moving towards a more negative view of our trading relationship, and they question whether the JCCT is able to make meaningful progress," said Bryson. 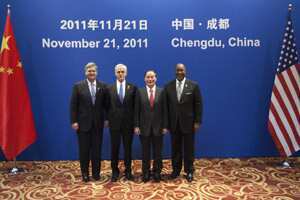 The first day of the two-day talks “did not make as much progress...as we need to," said Bryson. “It is time to work hard and deliver results," he added. He and the US trade representative Ron Kirk pressed China to make more progress on protecting patents and other intellectual property, opening government procurement purchases to foreign suppliers, and clearing up multinational firms’ worries about policies to encourage homegrown innovation. But vice premier Wang had his own salvo of requests: for cutting visa and export red-tape for Chinese businesses; granting China market economy status, so it is less vulnerable to anti-dumping measures; and easing restrictions on Chinese purchases of high-tech goods that Washington deems sensitive. “China is willing to develop even closer and broader economic cooperation with the United States," said Wang. The outcomes of this session of the JCCT talks will be announced in the afternoon local time.